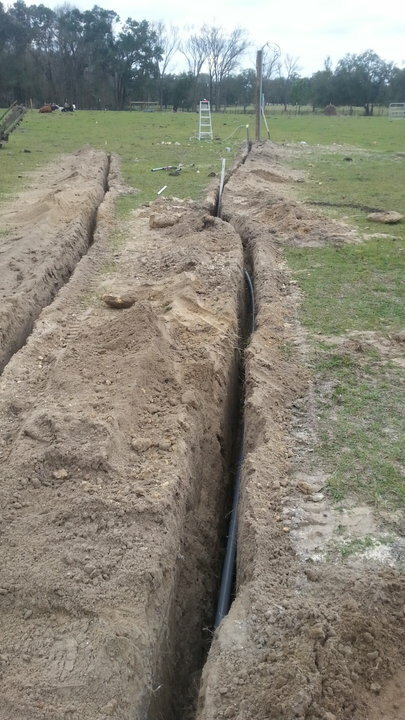 Need advice on "laying some pipe"
I just had a water well drilled and installed on my pine farm. This is my first well so I know nothing about this stuff. I watched the entire drilling operation so I know what is below the ground. Now I need to run a water line from the water tank to a pole barn. At the pole barn we will eventually have a toilet, sink, outdoor sink, shower and 2 outdoor faucets. The distance is +/- 70ft. The well tank will produce 60psi. The well pump is rated for 20 gpm. My first objective is to run a main line to the pole barn. Do I go with sch 40 or sch 80, white or black pic? I am not going with copper or piping.....its a pole barn. What diameter tubing should I use? Any other advice will be appreciated. I use 1" black poly pipe. 100 and 300' coils usually. Cheap. rocksandblues, C Dave, twofish and 3 others like this. tint dude, Budget, 2muchcoffeeman and 4 others like this. Last edited by MedicalManagement; 02-21-2019 at 05:05 PM. I” will be more than plenty at 70’. I’d use PR200 PVC, the OD the same but the ID is bigger than sch40 or 80. The smaller the ID the more friction loss. Did you fix your pig problem? Watched a lot of Night Hog Hunting in Texas on YouTube after you talked about your problem. 1”1/4 then 50ft of 3” then back to 1”1/4. Ya got good pressure going with 50 ft of three inch will create volume which is more important then pressure. I just did this last month. I had 1-1/4" out of the tank, so I used white 1-1/4" schedule 40 85' underground. I rented a trencher and put the pipe 18" underground (code for me was 12"), and it passed inspection. Of course, I used gray schedule 40 conduit underground for the electrical power for the well. Code is 18". Make sure you use the correct wire for the load for all the future power needs. Op trench it down 18" (that will be plenty for where you are). Black poly is very popular, do a little research as it comes in many different grades, and some are better than others. For that short of a run, 3/4" pvc in 20 ft lengths will be fine. Personally, I don't think pvc is the best thing there is for this application BUT if something breaks you can find pvc, and fittings, just about anywhere. Lay a little sand in the trench, put in the pipe, and cover with sand. You may also want to lay wire trace in there, but if it's a straight shot locating later may not be a problem. Put you a frost proof hydrant at the end to use until your other plumbing is ready. On all your other plumbing I would def use pex, and try to run it uphill from the supply in such a way you can drain it as much as possible when you leave. Add a "T" with an air compressor quick connect to blow out the rest. I put in about 550' of new water line at my camp a year or so ago (city water tho). PVC, or keep fittings on hand to adapt PVC to poly and back again. Pex without a doubt once you come out of the ground. I'm curious on this as well. PEX is rated for direct burial, no issues with meeting standards. Have to make sure fittings are suitable for direct burial, but for that size run should be a continuous run of PEX. The probably make pitless adapters that connect right to PEX, but I have not researched. PEX has been going in the ground long before it became so popular with domestic water systems. Its bread and butter used to be inslab heat and snow/ice melt systems, buried in a sand bed or directly in concrete. Perhaps the polyethylene piping being discussed is more abrasion resistant for direct burial. I'd like to hear from others. 1" or 1-1/4 sch 40 pvc buried as in the picture about 18" deep. Chances are unless a straight run and you will likely never have a breaking issue. Curious what size pipe is coming out of your well? If a submersible pump its usually 1-1/4". Once at the pole barn you can run PEX or something else in 3/4" to 1/2". The pros would use black poly 1" no joints,cheap,durable,easy etc. PF-88 and maintenanceguy like this. Wouldn't PEX be the same? One continuous run excluding the first and last connections. I've read that one of the advantages of PEX is it's ability to flex and more durable to freezing temps. but if you're a long way from town and have a problem, what do you think is the easiest thing to find? round2it, autobaun70 and mpaulk98 like this.